We are located at 25 Park Place in the heart of Lee’s historic downtown. Turn Right onto Route 20 West. Approximately one mile from the exit ramp, turn Right into Park Place. From Stockbridge, follow Route 102 East to Route 20 West toward the center of Lee. Turn Right into Park Place. From the North, follow Route 7 South to Route 20 East into the center of Lee. At the end of Main Street turn Left and take first Left into Park Place. The Lee Chamber of Commerce Booth sits just inside the park entrance. As you exit Park Place (onto Main Street) Lee Town Hall is immediately on your right. There is ample parking in downtown Lee all within walking distance of the church park. 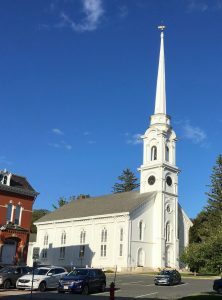 In addition to parking at the park, there is a lot on the west side of Main Street and a lot behind the church accessed from Franklin Street or High Street. Main Street has parking on both sides of the street.